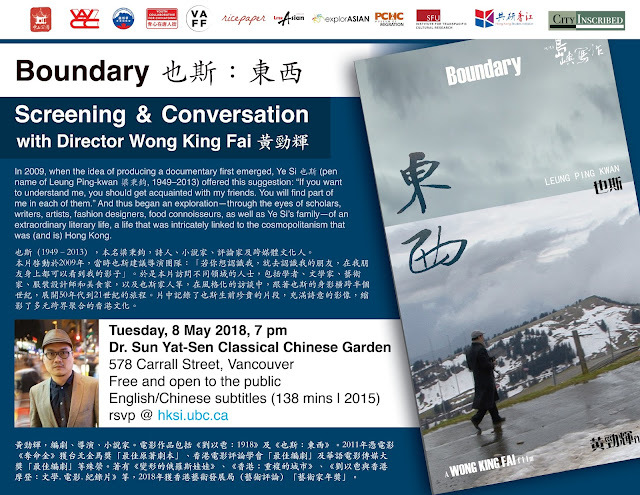 In 2009, when the idea of producing a documentary first emerged, Ye Si 也斯 (pen name of Leung Ping-kwan 梁秉鈞, 1949–2013) offered this suggestion: “If you want to understand me, you should get acquainted with my friends. You will find part of me in each of them.” And thus began an exploration—through the eyes of academics, writers, artists, fashion designers, food connoisseurs, as well as Ye Si’s family—of an extraordinary literary life, a journey that was intricately linked to the cosmopolitanism that was, and is, Hong Kong. This community screening is organized by UBC Hong Kong Studies Initiative and co-sponsored by Dr. Sun Yat-Sen Classical Chinese Garden, Chinese Canadian Writers’ Association, Vancouver Hong Kong Forum Society, Youth Collaborative for Chinatown, Vancouver Asian Film Festival, Ricepaper Magazine, LiterASIAN Festival, explorASIAN/VAHMS, PCHC–MoM Society, and Institute for Transpacific Cultural Research (SFU).